When taking social media measurement into account, many users and practitioners tend to focus on just the obvious metrics: number of page likes, number of followers, etc. However, focussing on just these things alone may lead to frustration and lack of direction in growing social media use. We have discussed some basic social media metrics in another post, but we didn’t really go about going deeper into the data. There are many ways we can dicuss these metrics further, but I would like to focus on the concept of Social Media Engagement Metrics right now. At the moment, there is no definitive formula to calculate social media engagement. Different people may adapt different calculations depending on how they make sense of the data. Based on the calculation shared in the image, we can look at a sample data using some made-up information. So, if you have posted two updates on Facebook on a given day, and they received a total of 10 shares/likes/comments, and you have 536 fans on Facebook, then your Facebook Average Engagement Rate for that day is .93. And, according to the same study by Social Bakers, .01 – 1% is the typical engagement rate of each Facebook post. The calculations give too much weight on existing fans or likes. One of the beauties of social media is its ability to go past one’s existing networks. To tap into one’s “reach”. That is why on Facebook or LinkedIn, you will see that your number of direct connections is only one aspect of your reach. Your contacts’ networks (or friends of friends) are part of your extended connections. The calculations appear to reward Facebook pages that are just “noisy” (ie, posts more often). The calculations don’t seem to take consideration the different aspects of each engagement. For example, Facebook EdgeRank considers photos, videos, and links to have more weight over other types of content shared. Some people even propose that comments have more weight over “likes” on an individual post, and shares have the highest weight out of the three. Regardless of the truth behind the actual Facebook algorithm, it is not easy to figure out what is the real rating of a post. If you have 26 comments, shares, likes, etc, within a week, then you would have that as the number of users engaged. If you updated 5x that week, then that’s your number of posts. On Facebook, you can see “Reach” in your Insights section and that will be the number of Users Reached for you. And, for this example, we can try to assume you have 1,067 as your week’s reach. 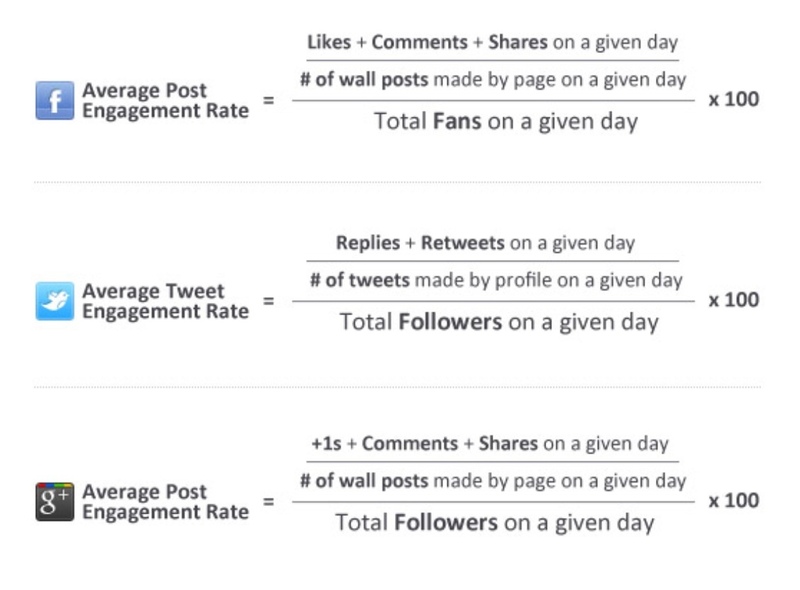 Based on these numbers using the alternative formula, your Facebook engagement score would be: .49% . Again, not a bad formula, especially if it can be computed against a standard that has been set. That’s the advantage of using the formula set forth by Social Bakers, as you are able to check your scores against an average score against different industries. I really like the ability to calculate engagement scores based on a given formula. This helps to standardise the measurements that are being used in social media. We’re still in the early stages of establishing standard scores, so we still have a lot to learn in making sense of all the data that we get. That’s why it’s important to be able to work with a social media professional who can help to make sense of your organisation’s data for you. And, not just on a superficial level of likes, followers, and connections. Amplification – This is the rate a post gets shared or ReTweeted. Conversations – These are all the comments and replies to an update or post. Applause – These are all the likes, favourites, or +1s. As part of the overall social media metric, Avinash also mentions Economic Value as another key metric. But, I am leaving this out for now, as we are just focusing on engagement scores at this stage. The multiplied scores of each area just provides more weight on what is considered to be of “higher importance” based on a theory of how Facebook EdgeRank is calculated based on actions. This approach completely takes out the number of total likes/followers and/or reach out of the equation. Each post is meant to stand on its own. Findings that more followers or likers equal less engagement based on the popular calculations of social media engagement. This is partly due to the fact that data does get skewed when posts are not seen by the said followers/likers. It takes out the “noise factor” and does not reward the quantity of posts by a social media account, but considers the quality based on actual engagement per post. Engagement does not rely on number of followers or likers. They rely on compelling content that is being shared at the right time, with the right people. We can make the assumption that not all followers/fans get to see our content. But, that doesn’t mean that the content itself isn’t engaging. We just need to find a way to make the content compelling enough so that whoever does see it would choose to engage with it, and therefore, increasing the possibility of the content being shared/seen in different networks. However, as mentioned earlier, these scores and alternative calculations will only make better sense if they are used against a certain standard and with a baseline information. It will be interesting to see comparative studies done on the different calculations used to measure social media engagement. 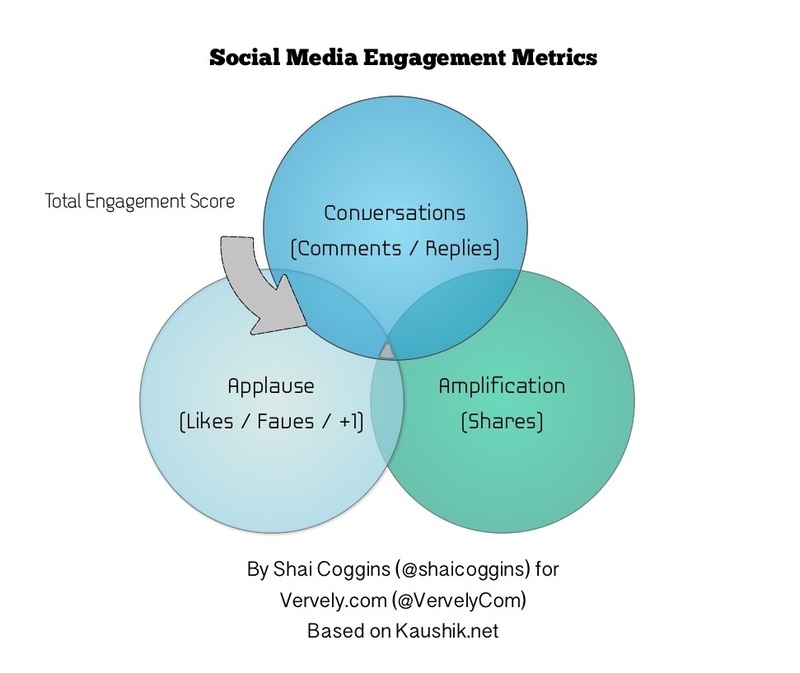 Do you measure social media engagement in your overall metrics? How do you identify and analyse your engagement areas? What do you do with the information that you collect based on these scores or ratings? Based on these calculations, can you share with us what your social media engagement scores might be for your different platforms?